In a highball glass filled with crushed ice, build the ingredients, stir with the bar spoon and garnish with grapefruit twist, after spraying the oils. In a sparkling wine (flute) glass build the ingredients on ice, stir gently with the bar spoon and garnish with lemon twist, after spraying the oils. Add all the ingredients in the shaker with crushed ice. Shake until it freezes. Double-strain and pour into a chilled martini glass (or coupette vintage champagne). Garnish with a basil leaf and a lemon twist, after spraying the oils. Add all the ingredients, except sparkling wine, in the shaker with crushed ice. Shake until it freezes. Pour into a tumbler glass without straining. Top up the glass with BiancoNero White Sparkling Wine and stir very gently with a bar spoon. Garnish with a lemon twist, after spraying the oils. Add the ingredients in a mixing glass with a lot of ice. Stir with the bar spoon for 20-25 seconds (old-fashioned style). Pour into an old-fashioned (or double-rocks) glass and add ice. Garnish with orange and lemon twists, after spraying the oils. Add all the ingredients in the shaker with ice. Shake until it freezes. 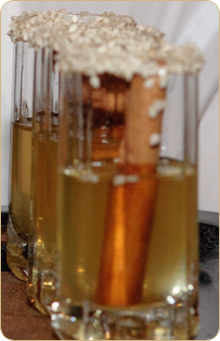 Double-strain and pour into a chilled martini glass (or coupette vintage champagne). Garnish with an orange twist, after spraying the oils. Put all ingredients in an old fashion glass, except for tsipouro and rosemary, and press lightly with a pestle or the back of a spoon. 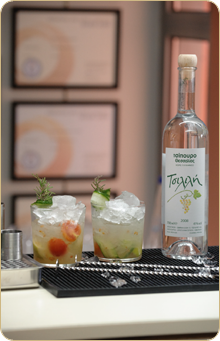 Fill the glass with crushed ice and top up with tsipouro. Stir gently, garnish with rosemary and serve. Pour all ingredients into old fashion glass, stir well and add crushed ice to fill up the glass. 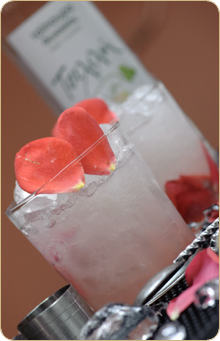 Garnish with rose petals and serve with a straw.